Who: Eco-lovin‘ travellers who enjoy cycling around. Where: Near Lidzbark Warminski in the north of Poland. 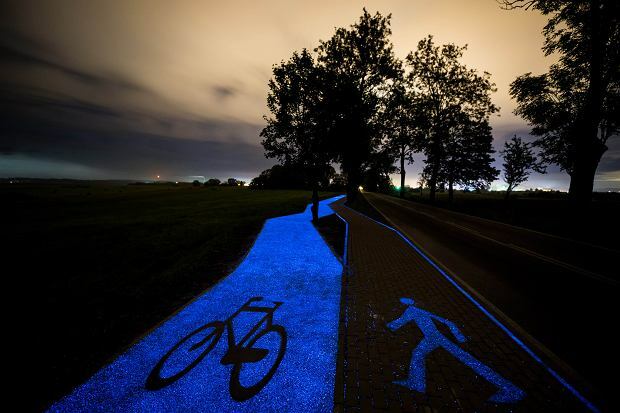 What: If it looks familiar, then you’ve probably heard or seen of Netherlands’ Starry Night bike lane. Inspired by it, but not quite, Poland’s own TPA Instytut Badań Technicznych Sp. z o.o have laid down a beautiful bike path that’s powered by the sun. The path is made from synthetic material that once charged by solar power during the day, gives out light for up to ten hours every night. Hopefully, the concept of eco-paths for bicycles takes off in Asia too! #2 Stolen Van Gogh Paintings Found! Who: The paintings were found by anti-mafia police. What: Two paintings stolen 14 years ago have been recovered! “Seascape at Scheveningen” (1882) and “Congregation Leaving the Reformed Church in Nuenen” (1884–85) were taken from the Van Gogh Museum in Amsterdam. Two men were arrested for the crime – apparently, they climbed up the museum walls on a ladder. Despite that, the police never knew (and still don’t know) where the paintings have been for the past two decades. They report that on top of a little damage on each, neither painting was found in its original frame. The FBI valued the missing artwork at USD 30 million. Who: For all travellers, as it’s hard to judge an animal attraction online without seeing it firsthand. Where: Our go-to portal for reviews, TripAdvisor, and its booking service Viator. What: We picked up on this a long time ago, and personally, we are so relieved that TripAdvisor is cancelling out ticket purchase options for hundreds of attractions that exploit wild and endangered animals. It’s the first time a major travel group has done this, and it came after months of working with groups such as People for the Ethical Treatment of Animals (PETA). This (long) list includes elephant rides and swimming with dolphins. To embark on a more conscious path, start with our guides to visiting elephant sanctuaries and ethical animal cafes. Who: Travellers unafraid of the dark. Where: Winchester Mystery House in San Jose, California, U.S.
What: The story goes like this – Sarah Winchester, an heir to a rifle company fortune, built a mansion in the 1800s in hopes of outrunning the ghosts of those killed by a Winchester rifle. Fast forward to today, a new room has just been discovered. A small attic space once boarded-up was revealed to contain items like a pump organ and sewing machine. Perfect timing too, as the now-turned haunted house attraction is known for throwing epic Halloween tours. Whether real or not, many visitors claim to hear organs play or see ghostly apparitions. Who: Small families or couples on a retreat. Where: Villa Borobudur Suites & Villas in Borobudur, Central Java, Indonesia. What: Staying at Villa Borobudur is akin to staying at a close friend’s home, set in beautiful natural surroundings with amazing views, specially cooked Indonesian cuisine and lots of insider tips. Set in a large private estate, Villa Borobudur boasts astonishing views of the Borobudur Temple and its surroundings. The owners of Villa Borobodur sought to create a true Javanese experience, allowing travellers to see the beauty of Indonesia beyond Bali. Photo credits: Main, 1, 2, 3, and 4.